Linda Burton posting from Pierre, South Dakota – “We should make some Indian tacos while she’s here,” said Janelle to Mel. I’d been standing at the front desk for a while, asking the questions I usually ask when I get to my new town; what do you enjoy doing; where do you like to shop; what’s your favorite thing to eat? Janelle had already told me that at her family get-togethers, it’s Indian tacos. Now she’s introduced me to Mel, the Manager here, and they are coming up with more ideas. “We have a lot of fishermen who stay with us regularly,” Mel said, “And they always do a big fish fry while they’re here, right outside.” She pointed to the open area just beyond the hotel door, out by the wicker chairs. “That sounds awesome,” I said, “when will they be here again?” A quick calculation and Mel determined that their visit just might coincide with mine. I hope it does. A bodacious fish fry out in the yard, some homemade Indian tacos; now you’re cooking, Pierre. I’m in the heart of fishing country here; I’m in the heart of South Dakota’s tribal lands as well. The cover of the Pierre Area Visitor Guide shows a man in a boat wearing a really big smile, holding a really big fish. 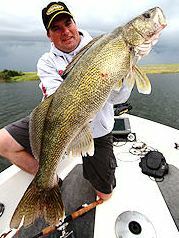 It’s a walleye, and the walleye rules on the Missouri River; northern pike and bass fishing are big too. The Guide is filled with ads for fishing lodges and fishing guides; the maps show locations of marinas and boat launching sites. Another South Dakota publication is devoted to the entire “great lakes” region of the state; four dams on the Missouri; four massive reservoirs, cutting through the middle of the state. Hook and line limits allow 4 walleye a day; 6 northern pike; 5 bass. Local hotels and motels offer fish cleaning and storage facilities; my Days Inn has that, and free minnows too. I’ve got a South Dakota Tribal Lands booklet too; nine tribes, collectively known as Sioux, are in the state. The Crow Creek Reservation is just east of Pierre (Janelle told me that’s her tribe); the Lower Brule Reservation is just across the Missouri from that on the west side of the river. 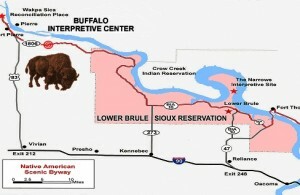 The Lower Brule Sioux Tribe has three bison pastures; they maintain a herd of 300 bison on 6,200 acres; there is an Interpretive Center too; I’m adding that to my “Places to Go” list. The other six reservations are north, east and south of Pierre and visitors of all ages are welcome; they offer colorful powwows, native art markets, hunting, and fishing (contact the appropriate tribal office about hunting permits on their lands). The booklet reminds: dress and behave appropriately when visiting, especially for ceremonial events. With the promise of fish frys and Indian tacos somewhere in the future, I am thinking about dinner tonight; during yesterday’s scramble of packing and unpacking and driving all day, I wound up eating mini-donuts and cheesy frito chips from the gas station shelves, washed down with a bottle of quickly-warm diet Pepsi, no ice available. I need a steak, I could imagine the smell of it. 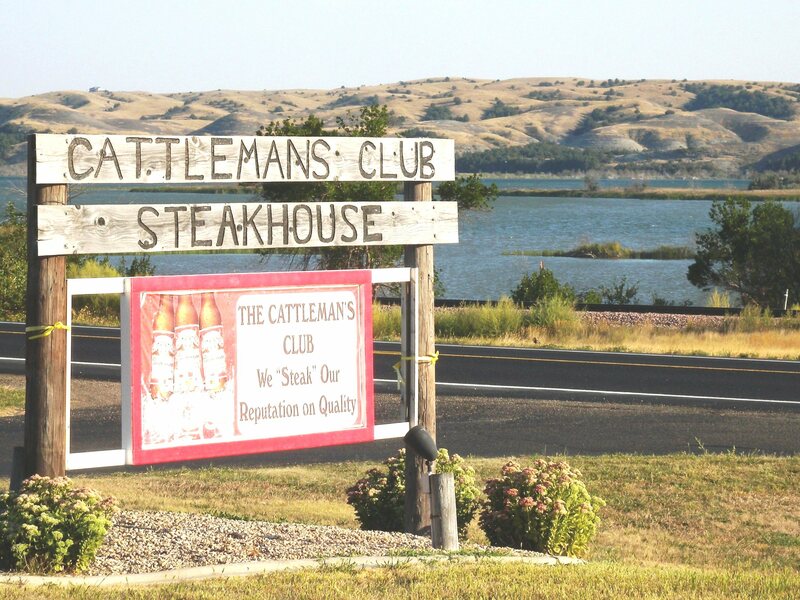 I Googled “steak in Pierre SD” and up popped an interesting face; it was Myril Arch, founder of the Cattleman’s Club, out on Highway 34. “I guess some people are just born liking to cook,” begins Myril’s story. ”I remember cooking for the hay crew of four men when I was twelve.” Myril tells of buying the Little Chef in 1974, a 10-stool place; he was running his ranch and farming too and sold it after a while. 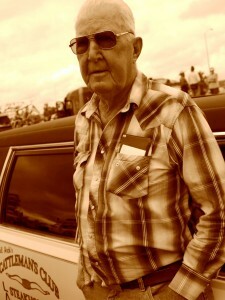 In 1986, during a time when the ranching and farming markets had gone sour, he and his son opened a bar. “I put sawdust on the floor because I couldn’t afford carpet,” he said. 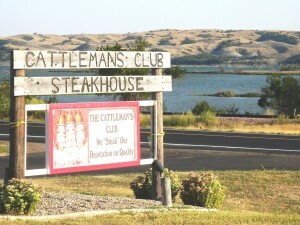 In September of that year they started serving steaks, and the business took off. In the years since, they have served people from all over the world; nowadays, they average 55,000 people a year, eating about 60,000 pounds of aged, choice beef. 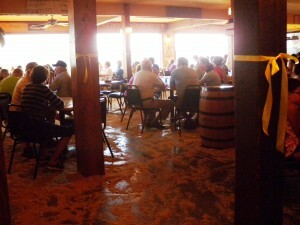 Daughter Cindy runs the steakhouse now, and there’s still sawdust on the floor. The menu is simple: steak. They take no reservations; Myril tells you “If you have to wait, it’s worth it.” The parking lot was packed when I arrived; I had to wait. And, it was worth it. A lively place, kids running here and there; old folks with walkers easing through the sawdust to a window seat (fold the walker, lean it up against the wall). Outside, across the street, Missouri River blue hangs tight against the golden South Dakota hills. The sun is going down, and here’s my steak; no parsley Mom! Meat, and bread, and South Dakota friendliness. Now you’re cooking, Pierre.